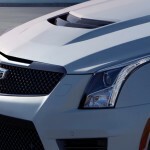 First Drive Review 2016 Cadillac ATS-V Coupe: Are we insane? The rest of the world must think that we Americans are simply insane. This is reinforced by the wild circus that occurs every four years otherwise known as the democratic process we call electing a new President. Looking at the frontrunners from an perspective outside America can help us understand why. We have a pompous billionaire reality TV star with a spray tan who is on his third marriage, and his second to a Slavic woman. He’s pitted against a woman who has already lived in the White House twice, but not as POTUS, that was her husband; she also seems to have some sort of trouble with email. Finally, there are contenders who feature a religious guy who is half-Cuban and was born in Canada and an elderly gentleman who seems better suited to be someone’s grandfather who might be suffering from borderline dementia rather than a potential leader of the free world (“Which button launches them missiles again? …tell them damn kids to get off the lawn!”). The point is that outside America our democratic system must seem all screwed up. Perhaps it would be easier if we had a royal family whose descendants simply took over when the king passed away, or if we had a dictator we overthrew when we got tired of him. Maybe we could choose a President based on the winner of a spirited game of “Jeopardy!” or “Survivor” (although someone would have to be “voted” off the Island every week and that would probably get screwed up as well). It must seem to a foreigner that there is little that America can do right. Except maybe wage war. That we seem to have a handle on. If needed we can bomb anyone or anything out of existence, we can do so in just a few short hours and be home in time to watch “American Idol”. There is something else we Americans have gotten right, especially in the last few years. After decades of producing cars that weren’t very exciting, save for a few notables, American manufacturers are starting to show the Europeans that they can’t always have the corner on the high-performance luxury car. We can now join them on that playground, thanks in large part to that most American of brands, Cadillac. We can now also confirm it. 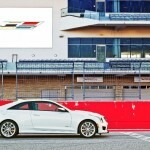 Thanks to a recent week with the new 2016 Cadillac ATS-V, in the past year we have driven it along with its rivals the BMW M3 sedan and M4 coupe, and the Mercedes-AMG C63. 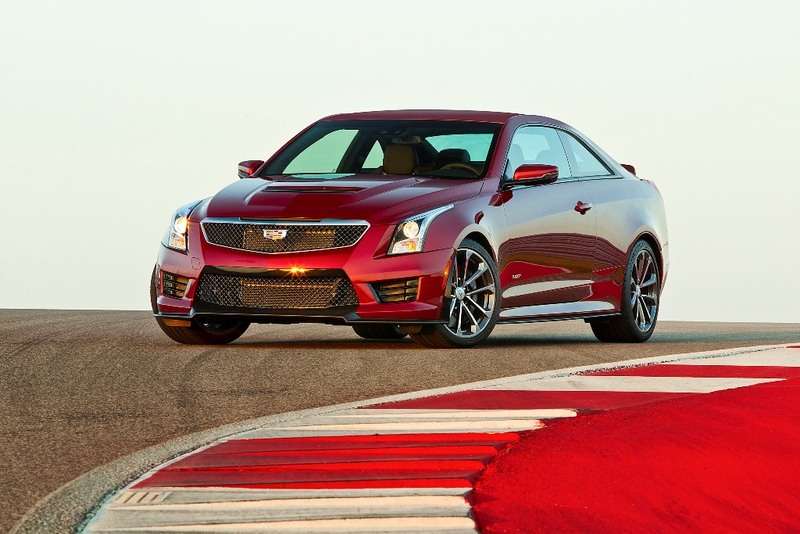 We even had a week with the 2016 CTS-V sedan and can now say that among all those this new ATS-V is our favorite. Last year we had a chance to spend a week with the ATS. It was okay, but just. Sure it was nice inside and looked good, but with a 2.0L Turbo 4-cylinder delivering 272 horses under the hood, it seemed woefully underpowered. This magnified any flaw we saw elsewhere; too small inside, too small outside. We were left wanting more. 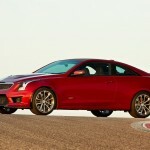 Fast forward to the ATS-V and we now have more. New for 2016 the V is the high-performance variant of the ATS line. It is offered as a four-door sedan or a two-door coupe. Both models come well equipped with leather upholstery, heated front sport seats with power side bolsters and manual thigh extensions, dual-zone automatic climate control, keyless entry and ignition, heated auto-dimming mirrors, automatic headlights, front and rear parking sensors, a power tilt-and-telescoping steering wheel, driver memory settings, a rearview camera and adjustable driving modes. There is also Bluetooth phone and audio connectivity, wireless cell phone charging, OnStar (with 4G LTE connectivity and WiFi hotspot capability), and a 5.7-inch color driver information display in the gauge cluster. 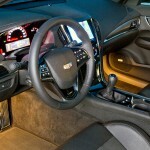 You also get the Cadillac User Experience (CUE) infotainment system with an 8-inch central display, voice controls, Pandora Internet radio integration, and a Bose audio system (seven speakers for the sedan, nine speakers for the coupe) with three USB ports, an SD card slot, an auxiliary audio jack and satellite radio. Panned by some, we have always liked the CUE system and after a bit of practice, found it easy to operate and responsive. There are a few option packages are available. Our coupe tester for the week had the Carbon Fiber package with added carbon-fiber exterior trim and a body-color rear spoiler. We also had the Luxury package that adds xenon headlights, an upgraded Bose surround-sound audio system (10 speakers for the sedan, 12 speakers for the coupe), a 110-volt power outlet, a navigation system and (for the sedan) split folding rear seatbacks in place of the non-folding seat standard in the sedan (the coupe has split folding rear seatbacks standard) . 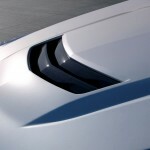 The Safety and Security package which requires the Luxury package adds automatic high beam control, automatic wipers, a heads-up display, lane-departure warning, lane-departure intervention, blind-spot monitoring, rear cross-traffic alert, forward collision alert and (for the sedan) rear side airbags. The Track Performance package includes the Carbon Fiber package. You can’t order the Luxury package, and thus the Safety and Security package and the Track Performance package. It adds the navigation system, a performance data and video recorder (enabling high-resolution, shareable videos of track driving with data overlays) and a low-mass battery. Additional options include a sunroof, red or gold brake calipers, Recaro sport seats and microfiber steering wheel and shift knob trim, all of which we had in addition to the sun roof and red calipers. There is also a Protection package that has such things as carpeted floor mats, tire inflation kit and tow hooks. Under the hood, the 2016 Cadillac ATS-V is powered by a turbocharged 3.6-liter V6 engine rated at 464 hp and 445 lb-ft of torque. Rear-wheel drive is standard, and transmission options are a six-speed manual (including automatic rev-matching on downshifts) and an eight-speed automatic with paddle shifters. Yes, you read that right; you can indeed own a Cadillac with a manual shifter. The CTS-V we had a month prior had a supercharged V8 and while it was a indeed a monster on the road, seemed a bit bulky. Lighter and smaller (CTS-V LOA 197.60 inches, curb weight 4145, ATS-V LOA 184.7 inches, curb weight 3805), the ATS-V seems just as powerful despite the loss of two cylinders, yet much more nimble on the road. 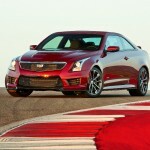 Our 0-60 time of 3.8 seconds in the ATS-V was nearly identical to the 3.6 second 0-60 time we got in the CTS-V. 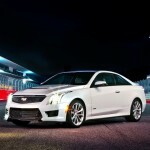 It was the nimbleness of the ATS-V that won us over. On the road the ATS-V is indeed beastly. The automatic transmission hit each of the eight gears perfectly while the Recaro seats kept us firmly planted. 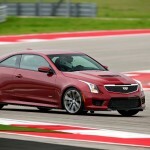 With the 18-inch alloy wheels, Brembo performance brakes, a sport suspension with adaptive suspension dampers (Magnetic Ride Control), and electronic limited-slip differential the ATS-V remained fully glued to the pavement. The carbon fiber additions and accents on the exterior turned heads and the two-tone leather interior surrounded with carbon fiber and microfiber accents made the cabin feel just right. The driving modes, Touring, Sport, Track and Snow can adjust the driving to suit whatever the conditions might be and there are even five sub-modes under the Track setting that can be dialed up. Our only real regret during our week was that we had no time on a real track with our ATS-V; we have no doubt it would have been up to the challenge. We did have a chance to unwind on some back roads far from suburban traffic and it was a magnificent experience indeed. 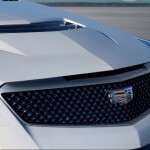 Cadillac has tried for at least ten years to make a high-performance luxury sedan that can compete with its European rivals. 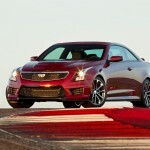 With the new ATS-V it seems that have now done just that. This uniquely American car can now rest on the same stage with BMW, Mercedes and Lexus. The ATS-V is a perfect example of just what America can do right, without having to actually bomb someone. Now, if we can just make it through election season. EPA passenger volume: 83.9 cu ft.
EPA trunk volume: 10.4 cu ft.